For most couples, choosing the wedding cake is a really big deal. 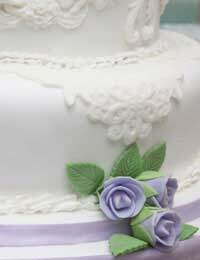 Long gone are the days when a 3-tiered iced fruit cake was the only choice that couples had - now there are so many different types of cake that it is essential that you take the time to go through the varied designs and flavours, to make sure that you get the cake that perfectly complements your big day. So where do you start? A good place to start is by figuring out your budget. There's no point in looking at cakes that are way more expensive than you can afford. It will only get you down and make you feel that the cake you are choosing isn't as good as the ones you couldn't afford. Work out how much you can spend on the cake, and stick to it. No matter how gorgeous it is, the cake won't look as good if you have to walk down the aisle in your jeans because you blew the dress budget on it! The next thing to consider is how big the cake needs to be. This will depend on how many people are coming to witness your nuptials. You might also want to consider spending a little more so that you can have some cake to send to those guests who couldn't make the wedding. Speak to friends and relatives and get word-of-mouth recommendations - especially if any of them are recent newlyweds. If you've seen a particular design in a shop window or a catalogue, then where possible, arrange to go in and speak to them and find out what kind of service they offer. Most confectioners and bakers will have a design book that you can look through for ideas - but if not, that's what wedding magazines are for! If you really can't find anything that lives up to your expectations then why not be creative and have a go at designing it yourself? When you've chosen the cake maker, make sure you place your order early. The later you leave it, the more you are at the mercy of inflated prices because there's not as much time to get things ready. The last thing you want to happen is that for some reason the cake isn't ready on time and you end up having to ask someone to run out to a local supermarket for a last-minute substitute. Round or square cakes are the most traditional kind- but you don't have to stick to that - cakes come in all shapes and sizes, from the traditional to the completely wacky. For example, if you met while supporting your local football club, then you might want to go for a fun and quirky cake that looks just like a football, or for the more romantic couples, it might be a heart shaped cake that captures your imagination. If you have a theme running through your wedding, then why not extend it to the cake? Sugared icing can be used to make anything from teddy bears in wedding outfits to cars, people, or anything you can think of. Gone are the days when a little plastic bride and groom were the only option to have as the centrepiece of your wedding cake. Colours, designs, emblems, fabrics and patterns can all be put onto a cake with relatively little effort, and can make sure that it fits in perfectly with the rest of the day's dressings. If you're having a Scottish themed wedding and all your groomsmen are wearing kilts, why not decorate the cake with the same tartan fabric that they are wearing? Or perhaps have some fun sporrans made from sugared icing dotted around the edges of the cake to make the connection stronger? It's these touches that can add fun and personality to a wedding and make it a unique day - so don't be scared to go with what you think is best - it's your wedding after all. Wedding cake has to taste good. If it doesn't, it'll be remembered - and who wants their wedding to be remembered for being the one with the horrible tasting cake? Vanilla sponge is popular because it's a simple taste that most people like. Chocolate is good too, though it can be a little rich for some - especially older guests. If you don't want to go for something 'run of the mill' like an iced fruit cake, then why not try cheesecake, different flavours of sponge cake, or even a profiterole stack or a tower of mini doughnuts with chocolate sauce trickling down the sides? When choosing your cake, remember that it will appear on a large number of your photographs - it's often the moment frozen in time on people's mantelpieces, or on the wall, so unless you want to be reminded of a terrible mistake every time you look at the photographs, take your time and make sure that your cake is remembered because it fit in and complemented the day perfectly, rather than because it stood out like a sore thumb.